Asics GT 2000 7 are stability cushioned running shoes. Very few changes in current Asics GT 2000 7 to improve what is already available, keeping what works fine and introducing minor updates to justify retail price rise. 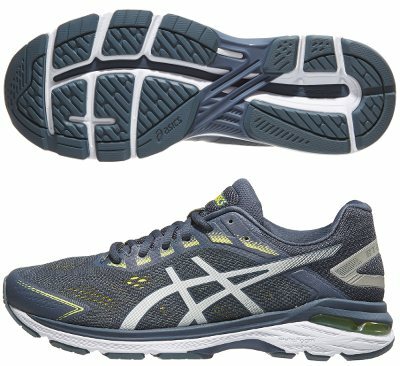 Although it does not star marketing campaigns like its bigger sibling the flagship Gel Kayano 25, the quiet success from GT 2000 7 is based on great blend of performance, reliability and limited price, something highly appreacited by regular runners. Those looking for more affordable running shoes should look at its smaller sibling GT 1000 7 which offers great value for money. As expected, upper is the only part which changes compared with its predecessor GT 2000 6 but it does in several ways to increase comfort: it gets more room in toebox and new multilayer "Jacquard" mesh is plenty of ventilation holes in forefoot to improve breathability. Another interesting feature is the new underlayer support system based on straps wrapping internal side of midfoot with custom fit thanks to pressure from shoelaces. Special Lite-Show edition is available to increase visibility under poor light conditions. There are no changes in rest of GT 2000 7 which maintains Asics' premium foam FlyteFoam Lyte™ as main component in midsole. Topsole is made of SpEVA featuring a more responsive ride while classical GEL® unit pads are embedded to enhance comfort in both forefoot and rearfoot. Progressive pronation control relies in typical medial post (dual density Dynamic DuoMax®) combined with plastic shank (Trusstic System®) in midfoot for necessary stiffness. Outsole keeps design and materials with durable AHAR+ on more exposed areas to increase durability and major flex grooves in forefoot for smooth transition.